795 nm Rb D1 fluoroscence from 780 Rb D2 absorption. Laser spectroscopy of rubidium is the basis for advanced atom sensors for positioning, navigation, and timing. This note describes a simple set up to demonstrate locking a laser to a Rb spectroscopic transition. Ultra-high resolution laser spectroscopy of the rubidium atom at 780 nm ( D2 line) and 795 nm ( D1 line) has numerous applications in sensing, metrology, and aerospace. In 2008 Photodigm introduced the first of its Spectroscopy Series DBR laser diodes to this market, a 60 mW device at 780 nm ( D2 line). This was followed by higher powers and additional wavelengths, so that by 2012, research scientists and product development teams had stable access to a complete line of single frequency DBR lasers for potassium, rubidium, and cesium. These devices are fabricated using Photodigm’s proprietary technology encompassing grating design methodology, single-growth epitaxy, and ridge waveguide process with monolithic holographic gratings. A proprietary facet passivation process protects the laser facets, allowing high reliability and the highest available powers. Delivering a single spatial and longitudinal mode beam with a side-mode suppression ratio exceeding 45 dB, Photodigm DBR lasers are ideal for spectroscopic applications. This robust process ensures high yield at the target wavelength and high reliability with long lifetime. As a result both atomic spectroscopists and instrument manufacturers will be able to confidently move forward with their programs. Fundamental to any atom sensor is the abilty of the laser source to lock to a transition. This requires a narrow bandwidth laser that can resolve and tune across the transition. With a bandwidth on the order of 1 MHz and tuning characteristics of 0.6 Å/°C by temperature and 0.026 Å/mA by current (30 GHz/°C and 1.3 GHz/mA), Photodigm Spectroscopy Series DBR lasers are ideal. 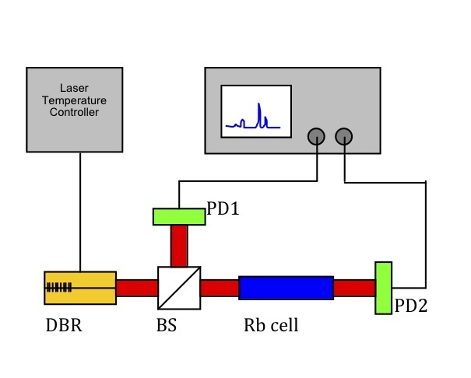 The optical part of the experimental set-up consist of a beam splitter BS, two photodetectors PD1 and PD2, a 100 mm long glass cell filled with natural rubidium, and Photodigm’s 780 nm high-power DBR laser diode (see Fig. 1). An oscilloscope measures the ratio between the two signals. Figure 1. Schematic of experimental setup. A constant current of 78 mA and a small 10kHz saw-tooth modulation of a few mA simultaneously drove the DBR laser diode. The heat sink temperature was tuned until the absorption lines were centered on the scope. Thermal and current tuning are 0.6 Å/°C and 0.026 Å/mA, i.e. 30 GHz/°C and 1.3 GHz/mA, respectively. Check out our blog post on tunable diode laser absorption spectroscopy for more details. Natural rubidium consists of mainly two isotopes: 85Rb (72.2%) and 87Rb (27.8%). Focusing on the D2 transition, both isotopes absorb around 780.024 nm but their corresponding hyperfine splitting frequencies are different. The ground state of either isotope splits into two hyperfine levels. The exited state hyperfine splitting is masked by the ~500 MHz Doppler broadening so that individual levels are indistinguishable by simple spectroscopy techniques. Thus, the expected transitions have ground state hyperfine detuning of 6.834 GHz and 3.035 GHz for the isotopes 87Rb and 85Rb, respectively. 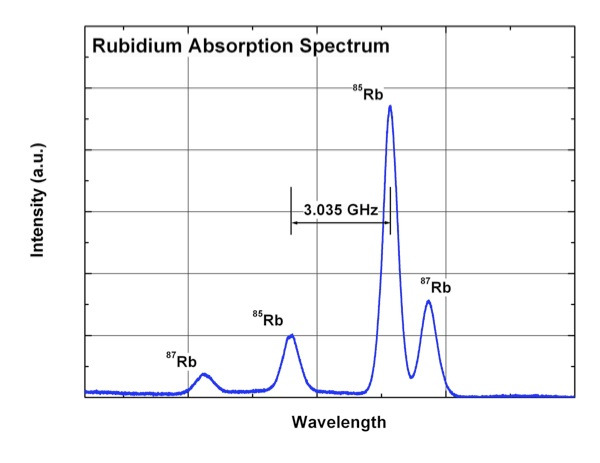 Figure 2 presents the absorption spectrum of natural rubidium monitored with the mentioned set-up. The four absorption peaks, two resulting from each isotope, are clearly visible and distinguished. Figure 2. Absorption spectrum of 85Rb and 87Rb recorded using Photodigm 780 nm DBR laser tuned over a 7 mA range. The linewidth of the used DBR laser diode is below 10 MHz and compared to the Doppler broadening of the transitions almost two orders of magnitude smaller. Photodigm Spectroscopy Series DBR lasers have many uses within the bio-medical, sensing, metrology, and aerospace markets. Atom cooling and trapping applications benefit greatly from the high power and frequency stability found in Photodigm’s proprietary DBR structure. Data storage such as optical ROM, holographic storage, and disc mastering are all uses for 780nm DBR laser. One of the highest growth areas for this single-frequency, high power DBR lasers are in navigation and spectroscopy. Photodigm’s lasers can simplify instrumentation design by reducing or eliminating the need for amplification or frequency stabilization components. This can result in dramatic cost savings for OEMs. Contact Photodigm for a laser solution, tailored to your application.